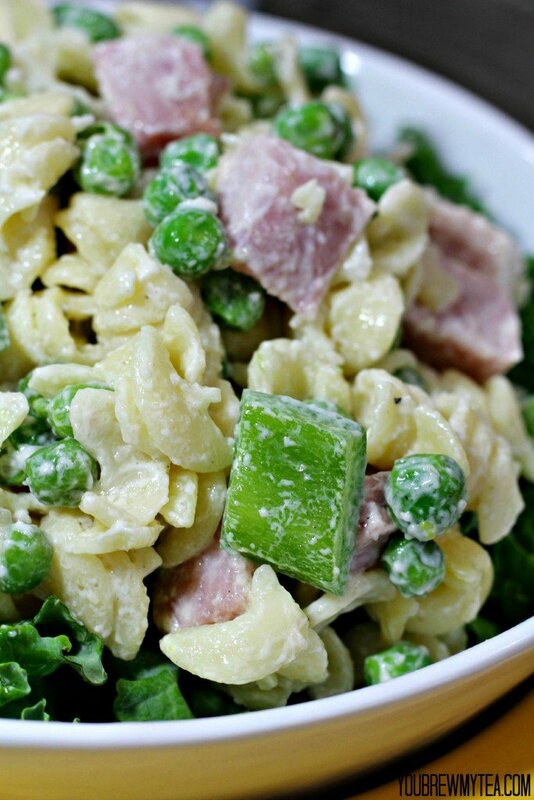 Do you love pasta salad in the summer? 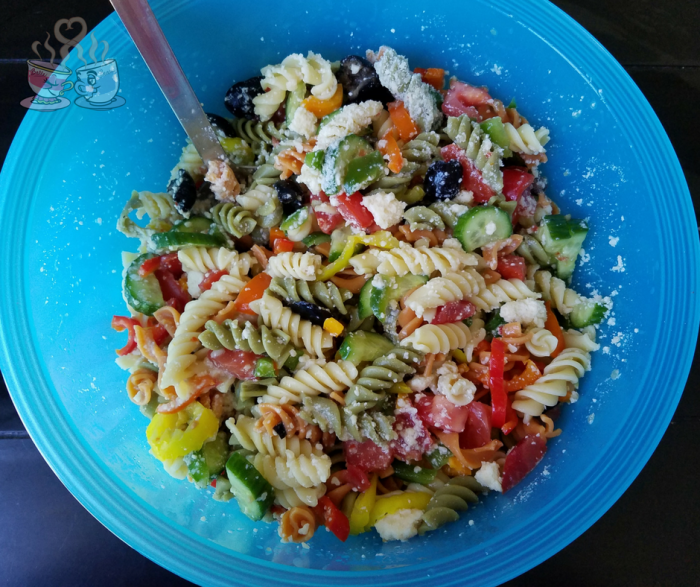 This Greek Pasta Salad is by far, one of my favorite side dishes for grilled chicken or burgers in the summer. In fact, it is adapted from one that has been around for years. I first had something similar to this at a church potluck when I was 14 years old. 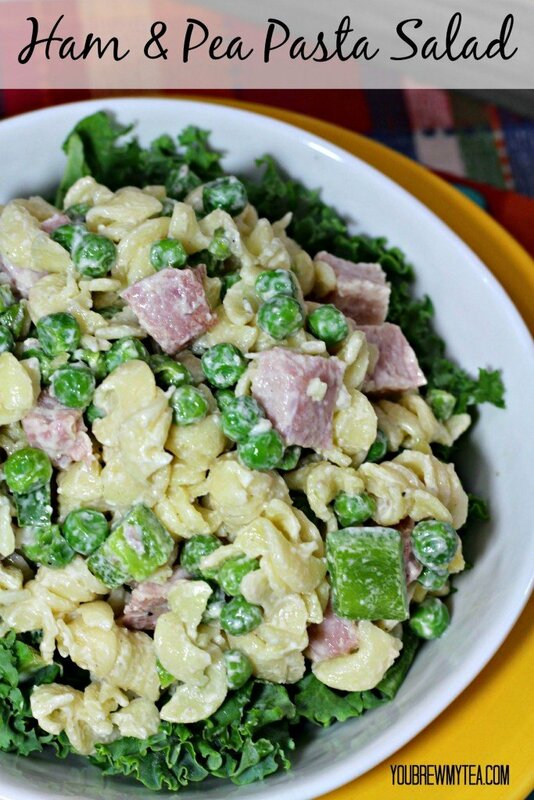 I remember the pastor’s wife making this, and knowing it would always be a favorite. This post contains Amazon affiliate links. I may earn a commission through purchases made via these links. Admittedly, this recipe is a bit of a stretch on being Greek, but it has enough Greek flavor for me to accept that name. 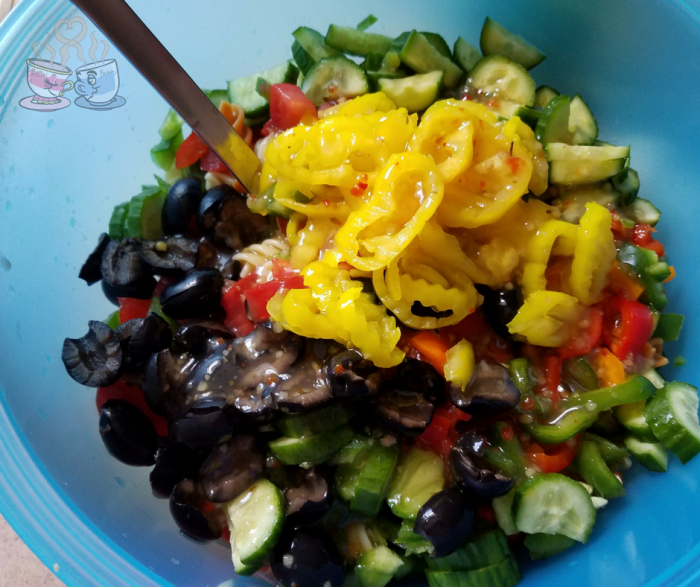 You could easily make a homemade salad dressing to go on this, but I personally prefer to just grab my favorite low-fat or fat-free Italian dressing. When you are in a hurry, that is the easy way to go. If you really want to eliminate some extra SmartPoints and calories, you may be interested in Walden Farms Italian Dressing. I don’t care for it personally, but many Weight Watchers friends love it. I typically by Tessemae or Newman’s Own. 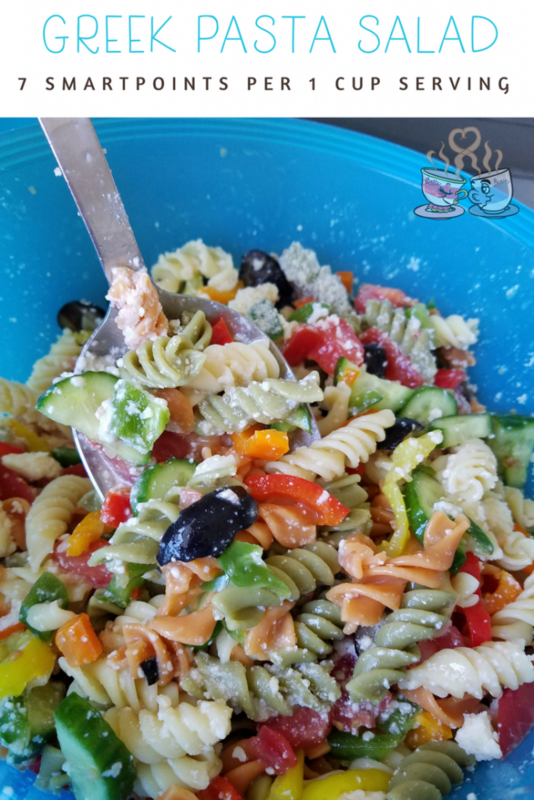 I use whatever rotini pasta is available in an organic or extra veggie blend, but you can use any pasta – even gluten free options. 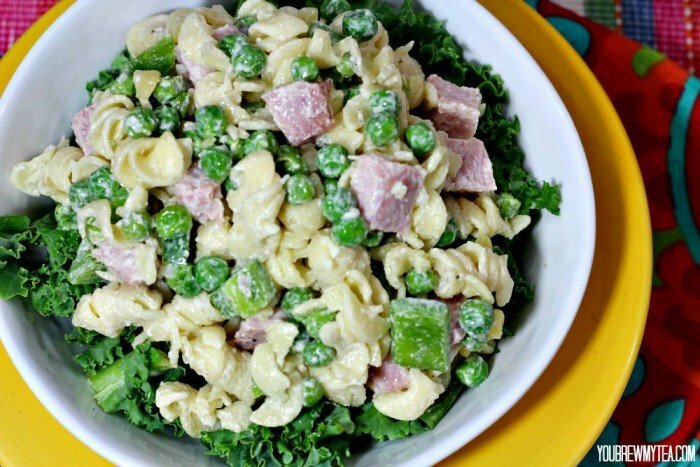 I calculate the SmartPoints on this recipe within the Weight Watchers dashboard. I am currently on the plan, so it is easy for me to get an accurate SmartPoints count. If you prefer, you can use the Weight Watchers SmartPoints Calculator as an option for using the plan without paying a monthly fee. I highly recommend the plan for healthy weight loss. Weekend picnics, BBQ’s, or get together as are always a favorite in our family. 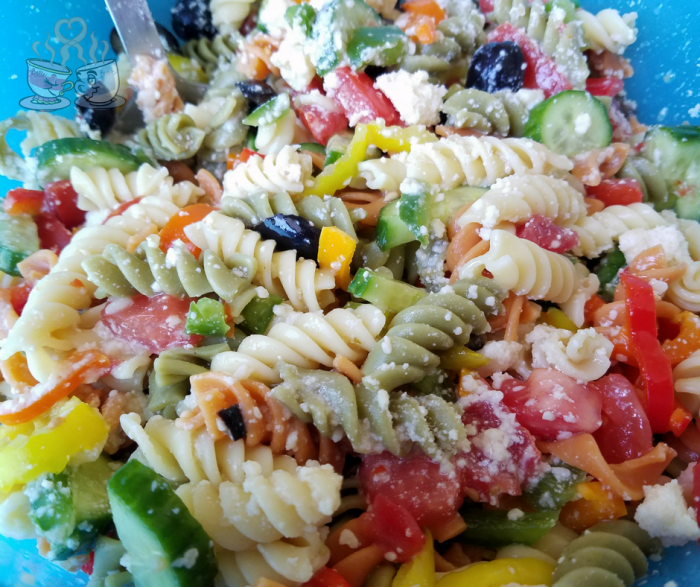 I grew up with pasta salad making an appearance on a regular basis, so this Greek Pasta Salad recipe is definitely one we will love having over and over again. 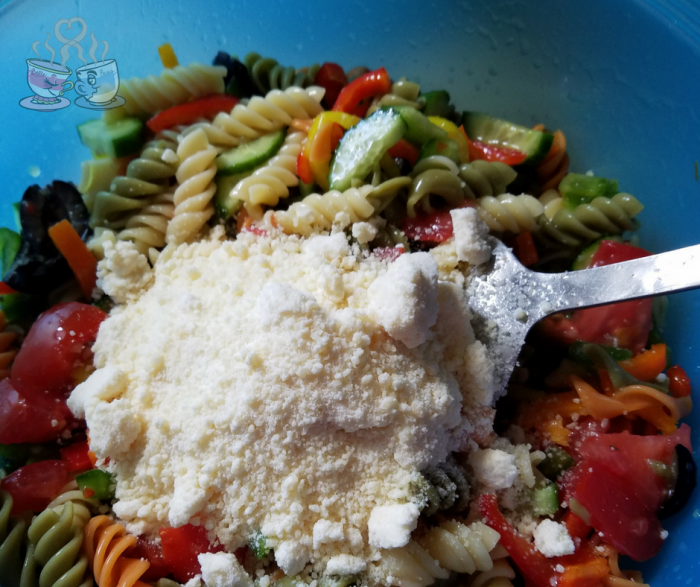 For best flavor, I recommend you allow it to chill completely and mix well to make sure all pasta is coated before serving.